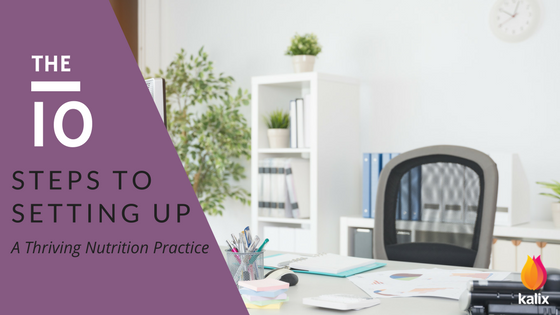 10 Steps to Setting up a Thriving Nutrition Practice – The Official Kalix Blog. Now that you’ve named your practice, what’s next? This is where the challenging part begins. There are several steps involved. Depending on your selected business structure (read our blog for more info), you may need to file business registration. We recommend consulting an accountant to obtain the right legal protocol to register your business lawfully. A great site to refer to is LegalZoom. They can take the stress off of you by handling any and all paperwork you need to file for a set fee. Traditionally, private nutrition practices have been purely physical office spaces. But things are changing! With the widespread availability of fast internet and the increased acceptance of telehealth (or virtual meetings) as a mode of communication, many practices are now partially or even wholly virtual. Kalix EMR offers you all of the software needed to run a virtual practice including HIPAA compliant virtual meeting platform, online forms, and paperwork, billing, appointment scheduling, secure messaging and more! Additional options for appointment locations, (other than the traditional office space) include visiting clients at their homes (i.e., home visits) or public locations, e.g., local library, coffee shop, or even a grocery store. Please note: when considering non-traditional appointment locations, special consideration must be given to patient privacy. Additionally, if you plan to offer insurance reimbursement, check with the insurance companies what appointment locations are covered. We will cover this topic in more detail in a future blog. If a physical office space is for you, we a few suggestions to keep costs down. Find someone in a similar field as you. Offer to pay them a percentage of your profits to sublease a room in their space. Some medical centers, fitness centers, and other professional offices offer shared office space that can be rented on by the hour, or by the day at a reasonable price. Setting up a home office is the most affordable option. With special care and consideration, it could work well for you and your clients. A National Provider Identifier (NPI) and Employer Identification Number (EIN) may or may not be required, depending on your business structure and where or not you decide to take insurance or offer superbills. Registration can be completed online and is free. Click on the following links to apply EIN and NPI. We recommend that you purchase Professional Indemnity & Liability Insurance. Depending on your business structure, you could be personally liable for your business financially and legally. If your practice is sued, without insurance, your house, savings, and other personal assets may be at risk. If a phone number doesn’t come with your office location, its worth considering using a virtual phone system. Virtual Phone systems are very affordable to set-up, are flexible, and do not require the purchase of new equipment. There are lots of companies out there offering these services. Make sure you choose one that is HIPAA compliant. We found Phone.com, RingRx, and RingCentral all provide secure HIPAA compliant VoIP phone systems. These systems allow you to purchase a local and/or toll-free numbers and have calls diverted to your computer, cell or home phone. If you are looking for a HIPAA compliant fax number, Kalix offers dedicated local and toll-free fax numbers as an add-on to your subscription. You may also wish to consider a virtual assistance or phone answering service. We recommend Nutrition Practice Management who will work alongside Kalix EMR. This is not as hard as it sounds! These days you don’t need to be able to code to build your own site. There are many website builder sites available that allow you to design a website quickly and easily, no experience required. You can choose a website design for a selection of premade templates. Templates can then be customized with a few clicks of the mouse. You can add or remove pages and choose graphics which represent your practice. In most cases, this whole process can be accomplished in a single afternoon. Website builder sites are also very affordable, often offering free base subscription plans. Popular options include Wix, Squarespace and Weebly. For a review of various builders, we recommend the following site – The Best Website Builders. Kalix’s Messaging functionality allows you to securely communicate with clients and contacts. Messages can be automated to remind and notify about upcoming appointments, as a reminder to pay outstanding bills, to collect client information via online forms and electronic paperwork), to communicate with other healthcare providers, as well a way to stay in contact with clients on an ongoing basis. We also recommend setting up your own email address for general inquiries and other communications. Many people do not know this, but it is never a good idea to use general email domains, such as gmail.com and yahoo.com as your professional email address. Instead, it is worth the time setting up your business email address using your own domain, e.g. [yourname] @ [yourwebsite]. Having your own personalized email gives a great professional impression on potential clients and makes it easier for anyone to contact you. You can set up your own personalized email address at the same time that you are creating your practice website. Your selected website builder platform will most likely have the option to purchase your own domain, e.g., nutritionpractice.com. Creating a domain specific email address is also often included as part of their subscription packages. Alternatively, you can set sent-up a professional email from your business web address with G Suite by Google. Next, you should choose a HIPAA compliant email provider. Your selected provider will be able to use your personalized email address. To read our recommendations for affordable HIPAA compliant email providers, please see our blog below. Create and order professional business cards and other promotional materials, e.g. flyers. The keyword here is professional. Ensure you create promotional material that sets you apart from others in your field and stands out. Some online sites that have excellent tools include VistaPrint and Moo. We also recommend creating a listing for your business with Google My Business. It is free, and you get to decide how your private practice appears on Google Search and Maps. Your clients can also leave online reviews, and you can respond to them. Stay tuned for next week’s blog as we discuss the importance of networking and the power it holds!